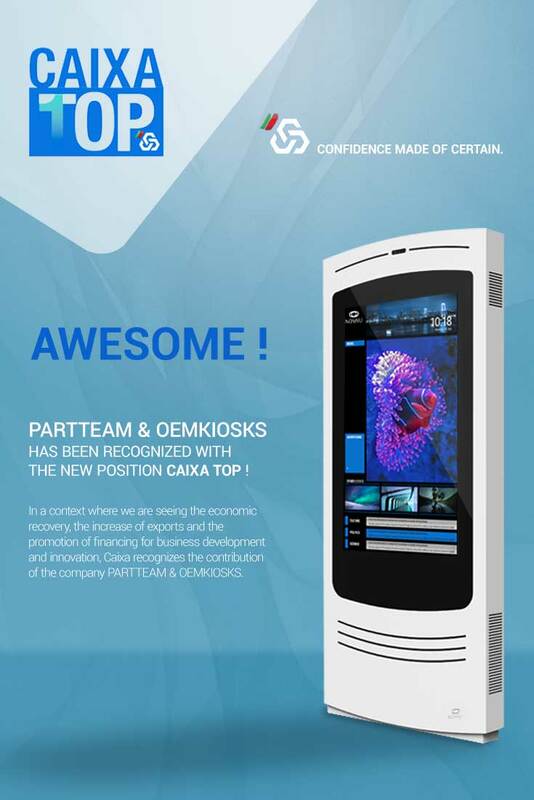 We are pleased to announce that PARTTEAM & OEMKIOSKS has been recognized with the new position CAIXA TOP by Caixa Geral de Depósitos for its performance, dynamism and competitiveness. Caixa Geral de Depósitos recognizes the contribution of PARTTEAM & OEMKIOSKS in the context of economic recovery, increased exports and the promotion of financing for business development and innovation. Pride and passion are feelings that move the PARTTEAM & OEMKIOSKS team on a daily basis, to develop customized technological solutions to the different sectors of activity. Being CAIXA TOP means to be a company with merit, trust and certainty. This is only possible thanks to the excellence of our employees, customers, suppliers and business partners, whom we thank and share with them. Founded in 2000, PARTTEAM & OEMKIOSKS is a globally recognized Portuguese IT company, manufacturer of indoor and outdoor multimedia kiosks, self-service equipment, digital billboards, interactive tables and other digital solutions, for all types of sectors and industries.